The Portland Water District says the partially treated wastewater ended up in Casco Bay because a disinfection tank wasn't put back online after being cleaned, and another was overwhelmed by high flows caused by overnight rains. An estimated 1 million gallons of partially treated sewage spilled out of Portland’s wastewater treatment plant and into Casco Bay Thursday morning, washing away a section of the Eastern Prom Trail, closing East End Beach and raising questions about whether to hold the annual open-water swim from Peaks Island to Portland that is scheduled for Saturday. The wastewater overflowed from a treatment tank and poured into the bay to the west of the beach and boat launch. It had already gone through part of the treatment process in which solids are removed. This is the first time the plant has an experienced an overflow of this type, said Michelle Clements, spokeswoman for the Portland Water District, which operates the plant. The water district reported the incident to the Maine Department of Environmental Protection, which sent an inspector to the plant Thursday. A spokesman said the department could change the plant’s operational plan or impose a monetary penalty in response to the spill. “PWD will submit a full written report on the incident within five days and DEP will determine what actions may be appropriate based on the facts surrounding this event,” the department said in a statement. Clements said heavy rains that fell on Portland overnight contributed to the spill. The city’s sewer system fills with stormwater during heavy rain events, adding to the typical 20 million gallons flow into the plant each day. The wastewater came from a disinfection tank where chlorination and dechlorination occurs at the end of the treatment process, Clements said. One of the two chlorine-contact tanks was drained for cleaning Wednesday, but the valves to let wastewater back into the tank had not been reopened. The surge of water during the overnight storm overwhelmed the other tank and it began to overflow. Each tank can hold 400,000 gallons. The water had been chlorinated, Clements said. 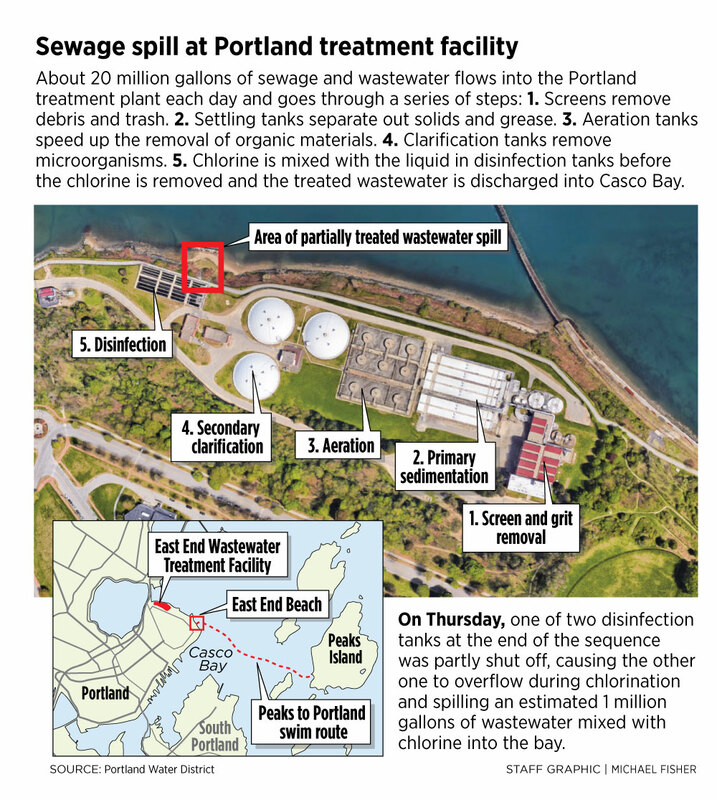 But it did not sit for the required minimum 30 minutes in the contact tank, and the chlorine had not yet been removed as it normally would be before the effluent is released into Casco Bay. “That contact time is important to get that full disinfection,” Clements said. Officials estimate the overflow occurred for less than an hour beginning at 6:45 a.m. A person on the Eastern Prom Trail reported the overflow to the city of Portland, which alerted the water district. Clements said she did not know why the plant staff did not realize the overflow was happening, and that question will be part of the investigation. Cathy Ramdsell, executive director of the Friends of Casco Bay, credited the water district with responding quickly to the spill. Still, it will be hard to quantify the damage done. Ramsdell said any remaining bacteria, pathogens or chlorine could be a risk to both people and marine life. 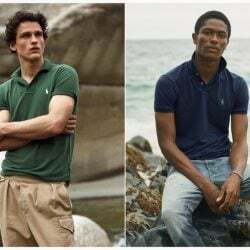 The organization will be watching for any ramifications in nearby Back Cove, where algal blooms have happened in the past. Ramsdell said the Friends of Casco Bay works closely with the water district and appreciates the work they do at the East End plant. A spokeswoman for the Maine Department of Marine Resources said the area near the wastewater treatment plant in Portland already was prohibited for shellfish growing and harvesting, and there are no additional closures associated with the spill. Maine Healthy Beaches conducts routine water quality testing at East End Beach and took a sample Thursday morning. The test takes 24 hours, so results will not be available until Friday. Meaghan Sims, the program coordinator from the University of Maine Cooperative Extension, said they are looking into their options to test the water Friday, as well. She declined to comment on the seriousness of the spill and referred other questions to the Maine DEP. Clements said the sewage treatment plant was running normally Thursday, and there was no noticeable odor in the area several hours after the spill. 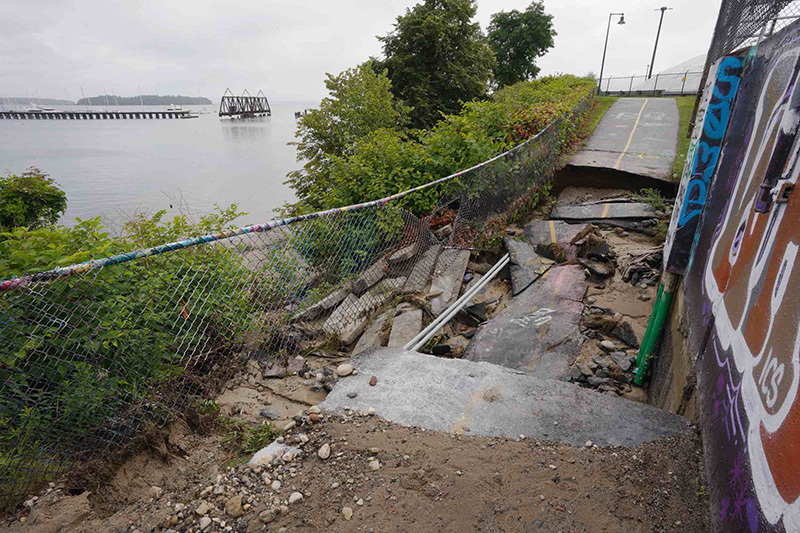 The water district is responsible for repairs to the Eastern Prom Trail, but it was unclear Thursday what the cost would be. The city said the popular walking, running and biking trail will reopen Wednesday. Until then, barricades have been placed around the damaged section. A runner on the trail Thursday morning paused briefly at the barrier, swore and turned around. Nik Coggins, 26, stopped his bike at one of the barricades and peered beyond it. He was on a bike ride around the city and did not mind changing his route, but he was surprised to see the extent of the damage. “It looks like Colorado, like a rock slide,” Coggins said. It was not immediately clear if the spill would affect Saturday’s annual Peaks to Portland Swim to Benefit Kids, a significant fundraiser for the YMCA of Southern Maine. An expected 450 swimmers, who have raised approximately $180,000 for the local YMCA, are supposed to finish a 2.4-mile swim across Casco Bay at East End Beach. An email to participants Thursday said the organizers would make a final decision about the race Friday, when the results of water testing will be available.